Is it too much of a good thing or just the beginning? The state – and Middle Tennessee, in particular – have seen a spike in permitted spirits distillers and bottlers since the passage of legislation in 2009 and 2013 that allowed liquor producers to start businesses. Since prohibition was lifted in 1939, just three distilleries had been operating in the state: Jack Daniel’s, George Dickel and Prichard’s, and they faced strict rules and restrictions about how, where and what they could produce. In the early 2000s, Tennessee lawmakers worked to reform the prohibition-era restrictions and remove legal obstacles for distilleries. By 2013, nearly all hurdles were cleared. The number of Tennessee distilleries that stood at three for nearly a century has grown tenfold in less than a decade. Tennessee is now home to at least 30 distilleries, numbers from the Tennessee Distillers Guild reveal. For those with a sense of adventure to go with their love of distilled spirits, there is a trail map to more than two dozen distilleries across the state, from new smaller craft-style operations like Nashville Craft to the well-known legends. The Tennessee Whiskey Trail was launched in June 2017, patterned after Kentucky’s 19-year-old Bourbon Trail. And while Kentucky’s trail is a 10-stop tour, Tennessee’s is at 26 and growing. The trail is not something to be completed quickly, but Boeko managed to roll up 1,300 miles and visit all stops over a series of weekends. Most of the distilleries are in Middle Tennessee and the Knoxville/Gatlinburg area with a few outliers in Chattanooga and Memphis, but the experience was fun and enlightening for Boeko. Getting to know the state is music to the ears of state tourism officials, and it is not surprising that the Tennessee Whiskey Trail is supported and endorsed by Tennessee departments of Agriculture, Tourism and Economic Development. Tennessee spirits surely conjure more pleasant images for tourists than construction cranes, scooters and pedal taverns. 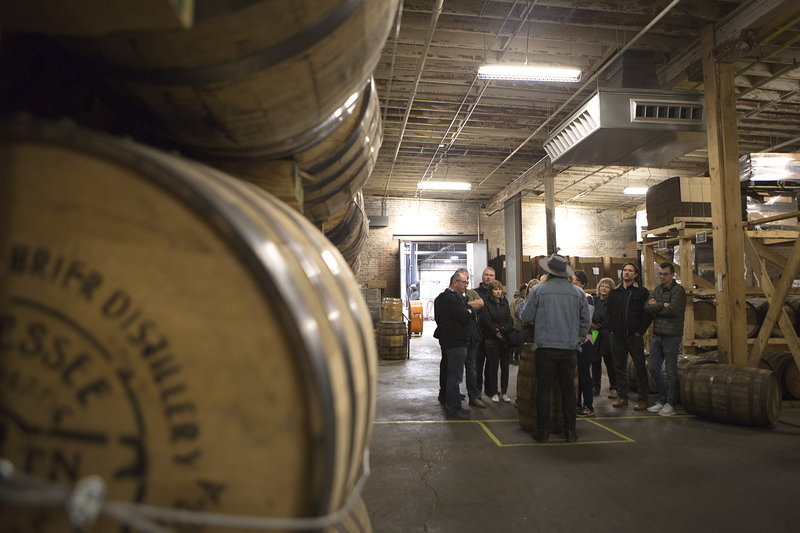 Miles McKee leads a tour at Corsair Distillery in Nashville. Corsair got a jump start on other distillers by operating in Kentucky before Tennessee law changed in 2009. The Guild formed in 2014 in part to unify all the new small-batch distilleries but also to promote and market Tennessee’s new spirit-making industry, says director Kris Tatum, who is co-owner of Old Forge Distillery in Pigeon Forge. By 2015, state whiskey exports were valued at nearly $700 million, ranking as one of the state’s top exports. The Kentucky Bourbon Trail has seen more than 2.5 million visitors from all 50 states and 25 countries in the last five years, its website states, which leads the Guild to believe its 30-stop trail can draw a much larger number. Tatum says he hopes the whiskey trail will “elevate the entire region’s tourism industry” and boost all aspects of the industry from hospitality to agriculture. Navigating the trail starts on its website (www.tnwhiskeytrail.com), and there is no order or timetable. -- If you’re catching the blues in Memphis or the aquarium in Chattanooga, stop at the only distillery in each city. “I grew up in Kentucky so I’m well aware of what the trails can do and how beneficial they are to tourism and promoting your product,” says April Weller-Cantrell on tnwhiskeytrail.com. Weller-Cantrell is director of marketing at Leiper’s Fork Distillery in Williamson County, where a 45-minute tour lets visitors view the entire whiskey-making process in a rustic cabin that’s more than a century old. Different landscapes and landmarks are part of the trail’s charm, along with the stories and history lessons heard along the way. The history and tradition of Tennessee whiskey will be shared with visitors who may not be aware that this state has for 200 years or more been a leader in spirits distillation – before, during and after Prohibition. Hundreds of thousands of people visit the Jack Daniel Distillery in Lynchburg each year, but that stop was a pilgrimage unto itself. Same with Tullahoma’s George Dickel stop. Both traditional spots welcome being part of a bigger trail. To pair with the drink samples served up to visitors, trail followers also can get a few shots of Tennessee whiskey-making history. 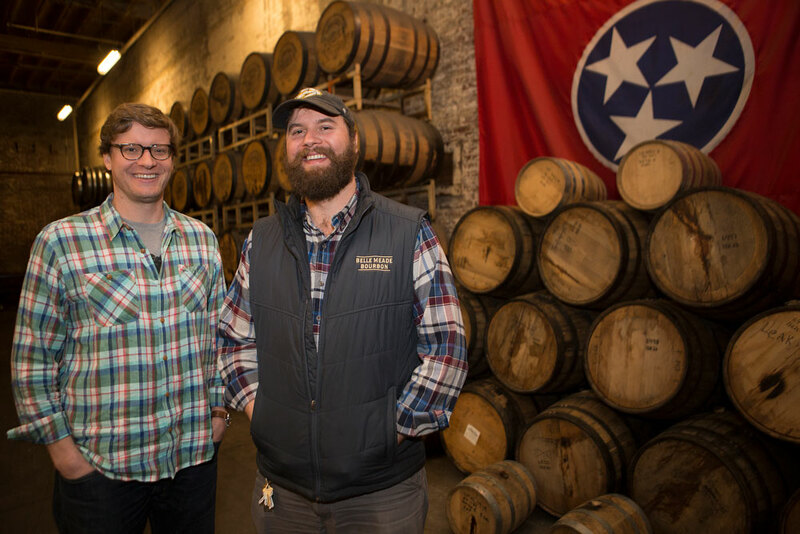 Nelson’s Greenbrier Distillery owners and brothers Andy, left, and Charlie Nelson, who have resurrected a family distillery that went away prior to Prohibition. The Distillers Guild says Tennessee has been a national leader in distilled spirits since before the Civil War. In what some say is fact and others say is lore, western expansion led pioneers to Tennessee, where they discovered another new world – a land where weather, water and soil made it the perfect location for making whiskey. So, they unloaded the wagons and pitched their stills. By 1900, there were several hundred registered distilleries in Tennessee. A decade later, whiskey making was banned, years ahead of the 1920 U.S. Prohibition Act. Even after the ban was lifted nationwide, state regulations severely limited whiskey production, with only Jack Daniel’s and George Dickel whiskeys being distilled and bottled legally. Prichard’s Rum followed in 1990. Before the 2009 law passed, distilled spirits could be produced legally in three counties. Now nearly half of the state’s 95 counties are eligible for distilleries. Many distillers jumped at the chance, and many of the first barrels that were filled are now available for consumption. Any county in which local legislation allows for retail or liquor-by-the-drink sales now allows the manufacturing and distributing of spirits. Several legal challenges to the 2009 law were made, but the last of those fell by 2013. The Guild was formed in 2014, and the Whiskey Trail was established in 2017. Tim Piersant, one of the founders of Chattanooga Whiskey, was an early proponent of getting the laws changed and launched a grassroots effort in Hamilton County to allow distilleries to return to the city. A “Vote Whiskey” campaign, in which he helped author both a state House and state Senate bill in 2013, proved successful. The sponsor of the 2009 bill, former Rep. Joe Carr of (R-Lascassas) consistently referred to the legislation as “a jobs bill,” and not a distillery bill. He was on record as saying distilleries would create jobs and generate money for Tennessee’s agriculture industry. Still, entrepreneurs saw something larger. In short order, investors were pumping millions of dollars into distilleries. Folks who were leaving other careers embarked on ventures they had rudimentary knowledge about but were determined to succeed. Boeko was a forensic scientist, for example. Despite the need for hefty start-up money – opening a distillery requires anywhere from $2 million to $12 million, Nashville developer Jim Massey says people were lining up to be first to launch craft distilleries. First, however, they had to buy equipment and barrels and secure the space to keep the stuff. Darek Bell and Andrew Webber, childhood friends who grew up in Nashville and now are owners of Corsair Distillery, were inspired to be among the first to open in their home state under the new state law. They had learned home-brewing here, but Bell eventually founded Corsair in Bowling Green. Bell has said he felt he had a leg up on other local distillers because of his experiences launching the Bowling Green business, and Corsair did become the first craft distillery in Nashville since prohibition. Jeff Pennington had the idea for his Davidson Reserve Rye Whiskey when he launched SPEAKeasy Spirits, (now Pennington Distilling Company) in 2011 but couldn’t tap it until last summer. Like many other craft distillers, Pennington made other spirits while signature whiskeys aged, including the best-selling Pickers Vodka. Spirits such as vodka, rum, traditional moonshine, even cordials, are produced and sold in quick fashion while the darker bourbons need to age sometimes as much as six or seven years. Nelson’s Green Brier Distillery, which was founded by Andy and Charlie Nelson, descendants of the founder, Charles Nelson, only last year unveiled the resurrected original Nelson whiskey recipe, calling it First 108 to reflect the number of years that had passed since it was last made and bottled. Whether First 108 will be anything like the whiskey produced in 1909 is anyone’s guess. Most of the recipes being created by the new craft distilleries are very experimental. “We are committed to trying new recipes all the time, but we like to think there’s a method to our madness,” Piersant adds. The decision to be more traditional or more innovative is what gives this renaissance its appeal. Adding fruit flavors, spices, and other options to the spirits is part of the creative spirit not seen in the larger distilleries, and in some ways, is why Jack and George folks don’t see this distillery business growth as threatening. Jack Daniel’s is a national icon, one of the largest whiskey brands in the world. More than 12 million cases of its black label recipe are sold annually, the distillery’s public relations manager says. People forget that Jack Daniel’s started as a small craft distillery “and Mr. Jack was a small entrepreneur himself,” the manager says. “Every time you lay down a barrel of whiskey, you’re pretty much writing a check and just putting it on the shelf for four to six years,” Pennington recently remarked. His operation is one of a few on the Whiskey Trail that wants to make the state’s signature Tennessee Whiskey. Not all whiskeys made in the state can use the title of Tennessee Whiskey – there are myriad rules to follow (see accompanying story) to be designated as such. It’s a lot easier to update a moonshine recipe or create something new for many small-batch distillers, adds Boeko, whose business is not based on traditional distilleries. Despite the differences in business styles, Boeko is pleased about one thing – how collegial the industry is. Tennessee spirits are available at many brick-and-mortar liquor retailers, some more widely available then others, and range in price from $20 to $45 a bottle. Most are available to sample and buy onsite. Others can be purchased online. 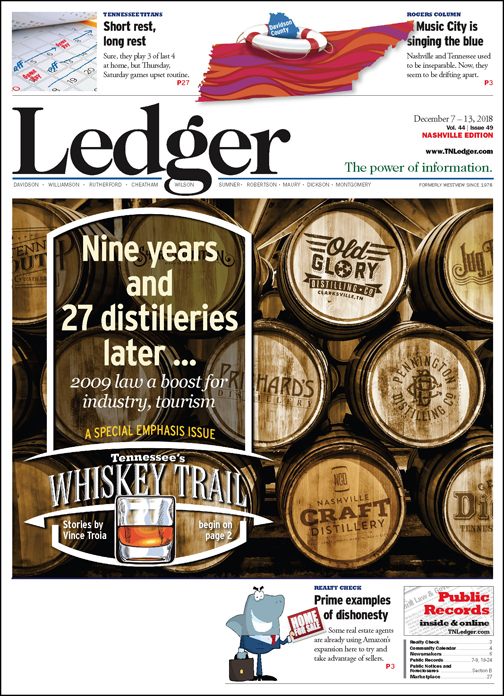 Along with spirits, landscapes and histories, distilleries along the Whiskey Trail have begun marketing campaigns on many other aspects of their businesses. You can, for example, have a wedding at a few spots, throw a concert for several hundred friends at another or hold an event in a 300-seat venue with riverfront views. Contests and drawings are being added to traditional tours and tastings, as well. For most the sky’s the limit when it comes to making spirits, but for individual guests a drink limit surely will be enforced.